Girls dresses come in many different styles to fit every occasion. Your little girl may jump at the opportunity to gussy up for special occasions, or she may run for the hills at the very thought of abandoning comfortable jeans. Whatever her personality, there are plenty of dresses available year round that hopefully you can come to an agreement on. 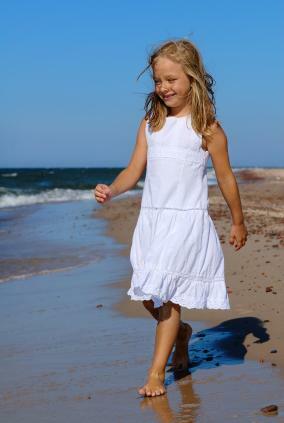 Casual girls dresses are helpful to have on hand for warm days or trips to the swimming pool. Throw them on over a swimsuit as a quick cover up for playtime, or use them as a quick change after getting dirty in the backyard. Casual girls dresses are also ideal for family events or church services where you're expected to be a little dressy, but not formal. There are plenty of places to find casual girls dresses, but your best bet is to start with your local mall and department stores. Ordering online is quick and convenient, but returning them if they do not fit properly can be a major hassle. J Crew's kids department features adorable casual dresses for little girls that are right on target with this year's fashions. You can find a cute selection of dresses (including the stylish shirt dresses) at Old Navy and Target. Specialty boutiques like Hartstrings and thrift stores are also fun to explore, and you just may find that special dress your daughter will love to recycle into her own closet. For semi-formal occasions, from piano recitals to afternoon weddings, little girls can wear a variety of styles. The latest trends include the ever enduring circle dress, the full-length maxi dress, and the timeless party dress with petticoats to add to its femininity. These can all be purchased at a high-end department store like Nordstrom, as well as Macy's and regional favorites like Bloomingdales and H & M. Semi-formal dresses often follow suit with the trends of the juniors and adult women's departments, so you'll usually be able to find similar styles in the various departments. This can be fun for a mother -daughter tea party, school social, or any other event where the two of you can coordinate and have fun with fashion together. Allow your little girl to go shopping with you if she loves to play dress up in the changing room, as you'll get the best fit and be sure to find a dress she agrees with if you take her with you to get the job done. Finally, life moments come up where your girl will need an evening dress. Perhaps she will be called upon to serve as a flower girl for a wedding, or asked to perform in a talent show. The sky's the limit on the possibilities that may come up, and it's always good to know where to get great formal wear with a little princess living in the home. Macy's will serve you well for regular children's formal wear. For the tiniest of formal wear, check out Tiny Tot Dress Shop, which sells infant and toddler gowns you will adore. Girls dresses are great for virtually any occasion, thanks to the broad selection available for purchase. The most important aspect of dress shopping is that your daughter feels beautiful in whatever is picked out, so help her explore her options and enjoy being girly the whole year through.